Whew that's a big recipe name, huh?? 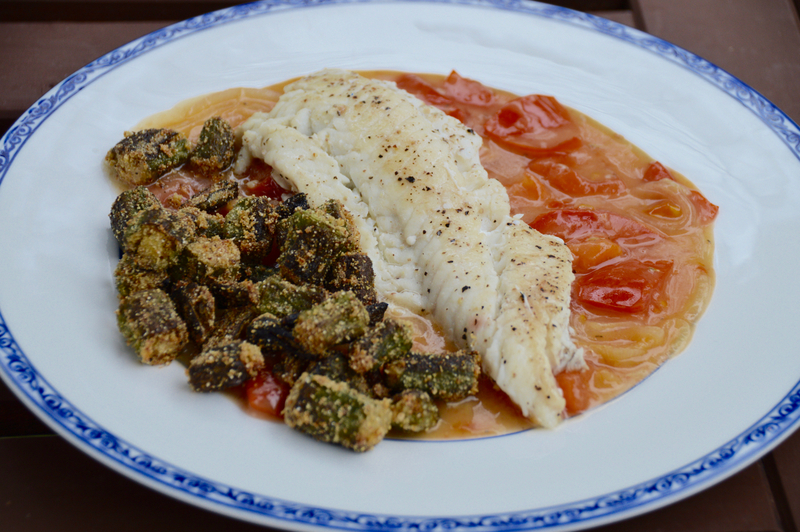 Well let me tell you, tautog with creamy tomatoes and cornmeal fried okra will be your new best friend this spring. Forget slimy okra - my quick and easy pan fried technique takes the sliminess out and only leaves you with little nuggets of pure okra heaven. This is the season for tautog on Cape Cod, and yesterday my wonderful hubby woke up at 4:30am to go work his fingers to the bone catching our meal for this evening. Word of advice - get you a guy that can catch dinner for you. The difference between a freshly caught fish and a store bought fish is like night and day. I love okra as if I grew up in the deep south all my life. Sadly, I have never even lived one real day in the south, but thanks to my Mom and her California and Oklahoma roots, I will always have a love affair with all things southern. Hush puppies, beans, BBQ, cornbread, biscuits, sweet tea, okra, fried green tomatoes, pimento cheese...ahhh!!! My mouth is watering! But back to the fish..
Springtime in New England always brings a big sigh of relief. The long winters we endure can seem to last a lifetime, so when the sun feels a bit warmer, the birds start chirping again and flowers, plants and trees start to bud, you know winter is done. It couldn't be a better feeling! With that said, this also means the inevitable. THE FISH HAVE ARRIVED. In particular, schoolie striped bass and tautog, also known as blackfish. We keep the tautog separate with just a light pan sear, allowing for you to fully taste the flavors of the fish. 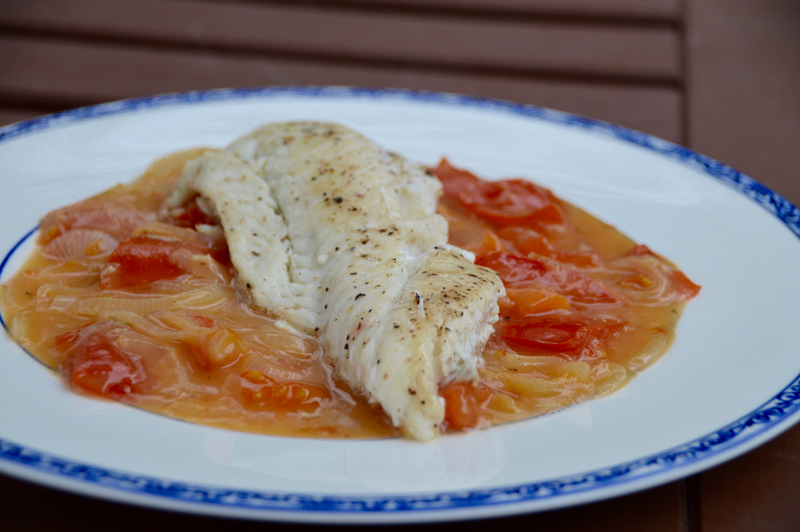 You could also do this recipe with just about any other white flakey fish as well, but if you can get your hands on some tautog, the buttery, rich taste of this firmer white flakey fish will knock your socks off. The sauce for the tomatoes is a light, creamy sauce flavored with a little lemon juice and fresh rosemary. If you have rice on hand, go ahead and serve that too, because this sauce goes perfectly with some rice! 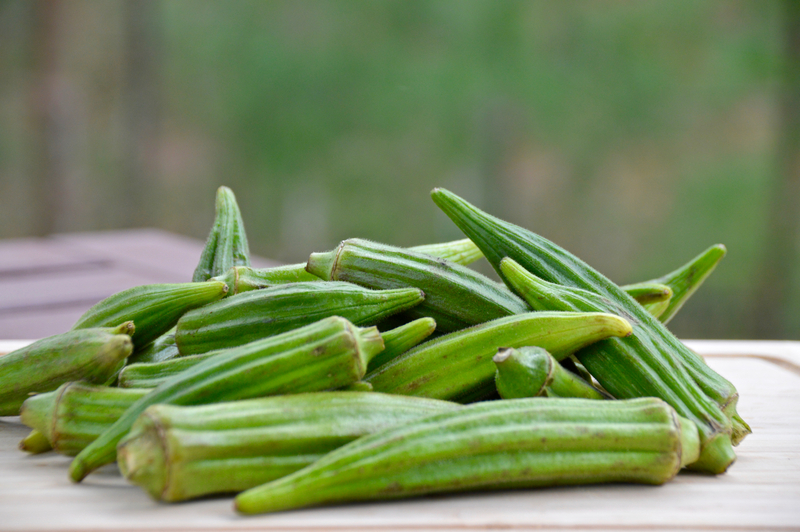 If you've never cooked with okra, it's very simple. Start by washing them, then trimming the stems and cutting them into 1/2 inch pieces. 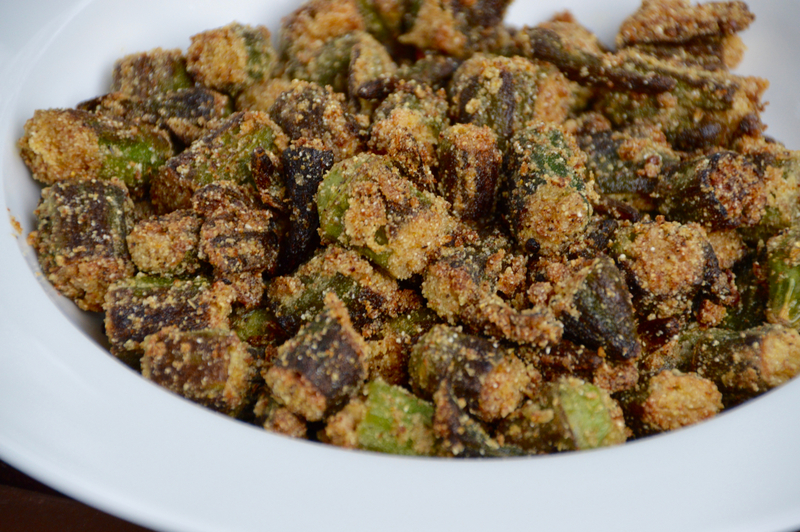 The real way to fry okra is to dredge it in egg then into flour and cornmeal with some seasonings, then put them into super hot oil and let them crisp up. I instead stir in 2 egg whites, a little cayenne, salt and pepper, then the cornmeal. Once they are combined, they go into a pan that's only coated with oil, for a light fry. 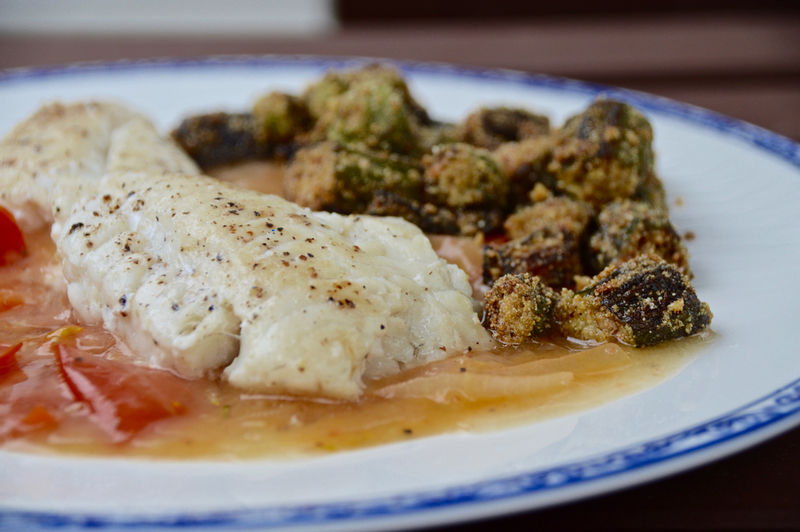 This method uses a lot less oil, and you'll still get a nice crispiness to the okra. The sliminess cooks out so the end result are little morsels of goodness that go perfectly with the tomato sauce for this dish. Have I made you hungry yet? I hope so! Check out the recipe below and happy cooking! In a large skillet, heat about 2 TBS canola oil over medium high. Cook tomatoes, onion, garlic and rosemary until onions turn transparent and tomatoes start to break down, about 5 minutes. Season with a bit of salt and pepper. In a small bowl, whisk broth and flour together. Add that to the pan and stir to combine. Bring to a low simmer and allow to thicken, about 5-8 minutes. Stir in lemon juice and add salt and pepper to taste. Set aside. In a large bowl, combine okra, egg whites, cayenne, salt and pepper and stir to combine. Using another large skillet, heat 2 TBS canola oil over medium high. Add okra, then cover and cook about 8 minutes, stirring occasionally, until they turn bright green. Take the cover off, stir to break up pieces and add more oil or cornmeal if needed. 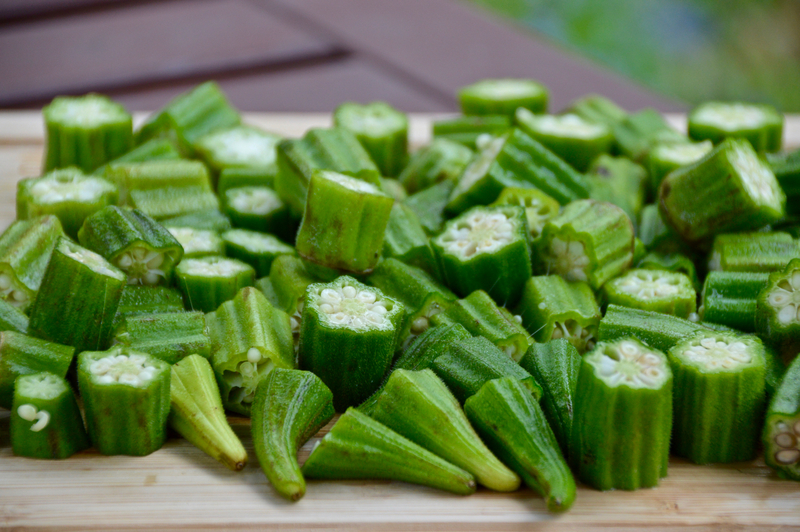 Continue lightly frying for about 15 minutes or until okra becomes browned and crispy. Using the same pan as the okra, wipe the pan with a towel to get the excess cornmeal out, then heat a little oil again (about 1 TBS). Season the filets of fish with salt and pepper on both sides, then place the fish filets down into the pan. Let each side cook about 5-8 minutes, depending on the thickness of the fish, until the fish is cooked through. To serve, ladle tomatoes on the bottom, then place a filet on the top. Spoon some fried okra on the side, then serve. 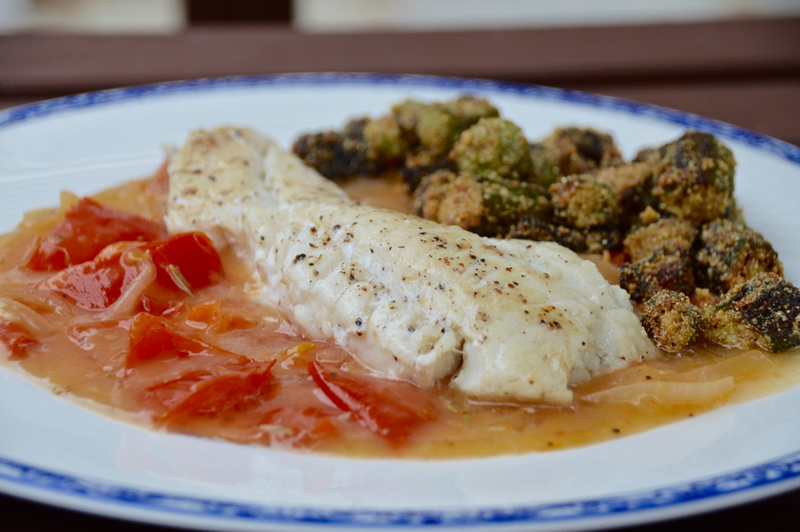 Okra and tomatoes are like PB&J, so go ahead and mix them up if you please!